Recently, from August 25-27th, many of us had the opportunity to participate in the 2017 Camp Connect at Camp Twin Lakes in Winder Georgia where we experienced a great weekend of fun, great food, valuable information and the opportunity to meet with other PKU families. This camp is affordable for many of our PKU families because of our relationship with Camp Twin Lakes. 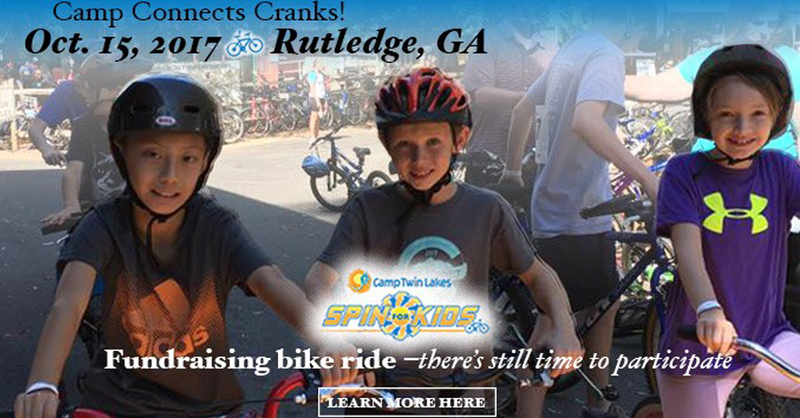 The Camp Twin Lakes “Spin for Kids” fundraising bike ride is our opportunity to help raise money that helps provide life-changing camp experiences for children with serious illnesses, disabilities, or other life challenges, including PKU, and is an opportunity to support our own annual Georgia PKU Camp Connect Camp. 1) Join our “Camp Connect Cranks” team! Spin For Kids offers a fun and fulfilling ride that winds through the scenic backroads of beautiful Morgan County, Georgia. Multiple routes accommodate riders of all skill levels. Participants can choose from six scenic road routes: 5, 15, 27, 47, 62 or 100 miles. Along each route, riders enjoy delicious homemade goodies and local fare at our rest stops, while our dedicated team of first aid, route marshals, and bike technicians keeps riders safe. Riders with young children can register their children to participate in Day Camp while their parents are out riding. After crossing the finish line, riders join family and friends in a celebration of their accomplishments including delicious food, beer, live music and a chance to explore Camp. To join our team, go to our Team Page, and click on “Join Team”. Be sure to choose our “Camp Connect Cranks” team. 2) Sponsor someone else who is riding. If you can’t join us on the 15th you can still support the Georgia PKU Connect “Camp Connect Cranks” team by sponsoring someone who will be riding. Go to our Team Page, select someone from the “Team Roster” and click on the “Donate Now” button.